With classic GameCube Luigi's Mansion coming to the 3DS later this year, you might think that's all the spooky ghost-busting action that Nintendo has planned for us. 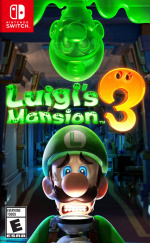 However in today's Nintendo Direct broadcast, we have learnt that Luigi still has unfinished business with those colourful ghosts and he will return in Luigi's Mansion 3 for the Switch next year. The game will of course be a sequel to Luigi's Mansion: Dark Moon on the 3DS, and from the brief glimpse we got at the start of the Direct broadcast, it's all looking quite promising. We'll keep you posted when we get more Luigi's Mansion 3 news, but for now be sure to share your thoughts on this upcoming title with a comment below. Awesome !! Always wanted to play this! Yes! Excited for this one. @kobashi100 not gonna happen. All people do is whine about the 3DS now. Luigi using a plunger as a projectile in the Simon Belmont Smash Bros intro video was a hint to this. I guess that is why they didn't put the original on the Switch. It still would have been nice though. Best announcement. And Animal Crossing. Best thing from the direct. Cool--but it doesn't look particularly stand out visually. And seems like they've went with the generic ghost designs seen in the 3DS game rather than the superior designs of the original GC title. Still, should be fun. Best part of the direct... and it was the first. What a way to open the Direct! I loved Dark Moon and can't wait for the 3DS port of the first game next month. This being the kick-off game was awesome! For what I can see it's inspired more by the second game than the first, which is kind of a bummer for me personally. I much preferred the style and atmosphere of the first one. This was the best announcement of the Direct (followed by Animal Crossing), the rest, unfortunately, had absolutely nothing for me. I was waiting for a Metroid Prime Trilogy HD until the last second and was sorely disappointed. The new Assassin’s Creed Cloud game is an aberration priced as a full game when you don’t even own it, just rent it for about 2 years and you can’t play on the go because you won’t have Internet access. 1&2 HD??? It would make sense! Honestly, this and Animal Crossing made me dance around the living room in celebration - they are two of my absolute favourite Nintendo franchises EVER, along with Zelda, Fire Emblem and Pokemon. Considering that games for 4 out of those 5 will be coming out next year, 2019 will officially be the best year ever in term of games IMO. Best Direct we got in a long time, 10/10 for me. The third will be awesome!!! Awesome news! If only they would remaster the others for Switch so we can have the full series! I am definitely happy that Switch is finally getting a Luigi's Mansion of its own, I wonder if it will be more like the original, or Dark Moon. Now this is the kind of first party news I've been looking forward to! Hyped. What a way to open a direct!! Anyone else notice he's wearing the Poltergeist design from the Smash trailer for Simon? Never played any of the titles in this franchise. Despite this, I couldn't help but be a little excited for this. I am SO excited about this!!!!!! Can’t wait!!!!!!! THANK YOU NINTENDO!!! A very pleasant surprise. In spite of Luigi being my favourite brother (sorry, red stache), ironically I never saw much into Luigi's Mansion beside the bulk of Luigi's modern characterization hailing from there, mostly because I'm more of a platformer nut. But given how wildly popular the spinoff series is, I'm glad for everyone who understandably went nuts over this announcement. What a direct! Luigi’s mansion is such a brilliant franchise fullto the brim with great atmosphere and gameplay, so you can betcha I will be buying this day 1. @PixelViking64 I was hoping it would be more along the lines of the Luigi’s Mansion Arcade minus being on rails. But should be good nonetheless. This excited me the most! At first I thought it was the 3DS title but I quickly realized the game play looked too good! I'm guessing this will be October 2019 and you'll see a full trailer for it at E3 2019. There are so many great games for 2019. It's like Nintendo needs a down year then a big year. 2017 was a monster year, 2018 was smaller, and now 2019 is gonna be huge! Day 1 buy. No questions asked. Right when I saw Luigi strolling in with THAT Poltergust, I knew Sakurai's Simon Smash Bros. reveal trailer was messing with us all this time. @link3710 I have that Poltergust design burned into my mind after GameXplain dedicated a segment to discussing that so I immediately recognized it. Hell jyeah! Best Direct of the year. I'm very pleased. Still surprised they didn't show Red Guerrilla or Saints Row. Probably in the December Direct. I might just have to pick this up. I never played the original, but I quite enjoyed Dark Moon. It took me a while to get into, but eventually I started to see its charm. It seems to me Luigi's Mansion 3 is the first unexpected pleasant surprise we've seen from Nintendo in quite some time. 2019 is looking a lot more promising after what I would consider a rather mediocre 2018. Got about 10 hours on a flight Sunday and Ive never played a Luigis mansion all the way thru.. I'll start on dark moon on my 2ds and look to finish it before 3 comes out. And maybe pick up 1 on 3ds too. This game is gonna be dope. Definitely looking forward to this. I have tried so hard to enjoy LM2 on 3DS but just cannot get into it. 2019 on Switch makes 2018 look like the joke it was. One of the best parts of the direct. Hopefully it's not as mission based as Dark Moon was, and that there's more exploration. 2019 looks promising so far. @roboshort I wasn't even aware that was a thing. Looks absolutely crazy! I'd like to be hyped because I love the first one, but Dark Moon is garbage. Best new game announcement for me. Yes I want it. I wanted it for the WiiU so yes. Hope they drop the whole missions thing from 2 also. It really irritated me that you had to keep coming in and out of the gameplay unnecessarily. I like it how Nintendo immediately assuaged my fears for last night's Direct by starting with one of my dream games right away. I still can't believe this is happening. 2019 is going to be 2017 levels of Switch goodness. I’m so freaking happy!!! Love Luigi’s mansion. finally Nintendo is finally bringing us one of my favorite games to the Nintendo Switch. too bad they are not bring the first two luigi's mansion games over to the Nintendo switch as well. it would be the perfect trilogy of games. I mean Luigi's Mansion 2 was a huge success so it makes sense. But it still makes me damn happy. I think that Nintendo will also do a sequel to Kid Icarus since that game sold more than the Kirby games. -Beat and loved the first game. -Beat most of the third game but my son kept taking the cart so I never finished it....it did start to drag on though before that. -Looking forward to the new one. Really looking forward to this game. NLG did a fantastic job with Dark Moon so I'm excited to see what they have for 3. @TipsySonic Looking over the game in more detail, I've noticed that quite a few things seem like a possible step down from even the GC game, which is generations old at this point, such as the lighting/shadows, the ghost designs, and maybe even some of the environmental details like curtain and stuff blowing and flapping around. The origin Luigi's Mansion was actually a pretty great graphical showcase for the GC. It will be interesting to see what the final Switch product is like. Yes, its happening! I wonder if Next Level is working on it. The second one was sooooo good, so I am looking forward to it. Only redeeming factor of this pathetic Direct!